Kaijuu Monogatari (貝獣物語, Kaijuu Monogatari? lit. Shell Beast Story) is an RPG developed by Birthday for the Famicom and published in Japan by Namco near the end of 1988. An English subtitle "Shell Saurs Story" is a translation of the game's name, with Saurs being an apparent attempt at an abbreviation for "dinosaur". The game would eventually spawn its own franchise with sequels and spin-offs being released for the Super Famicom and Game Boy in Japan. This is Namco's first published "traditional" console RPG. It follows a very established formula; obtain a quest from a king, learn more from towns people, and fight enemies in the wilderness through turn-based combat to grow and become stronger. The gameplay and artwork of the game looks extremely similar to Dragon Warrior and clearly drew inspiration from it. 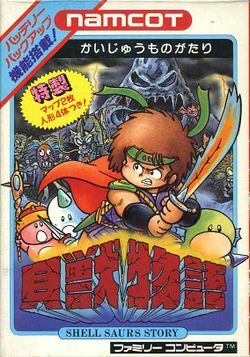 Even the box art employs a similar style to Akira Toriyama, the character designer for much of the Dragon Warrior series. In this game, the player does not just control one character, but rather four characters independently, and choose to unify them into one large party, or split them off into individual parties as the player sees fit. The game also came with a large cloth map which represented the "known world". It did not represent every feature of the outside world, but gave a fairly accurate depiction of all the major and minor geographical features of the world. The game is known for it's brutal early game difficulty, where level 1 characters can barely survive two battles, let alone one, without returning to a town for healing. On top of that, the player must effectively solo level four different characters in order to make them strong enough to survive the journey to unite with others. The game was not released outside of Japan, but a fan translation was release by KingMike in 2006. The patch for the translation can be found here. Many years ago, a race of animals lived in the world called Shell Monsters who wore small shells on their backs. These Shell Monsters cared for the world and protected its peace, and lived happily on Shell Monster Island. Shell Monster Island's protective charm was enshrined within three shells. Years before, there were four. These shells had fought the Great Dark Demon Lord, and lost one of their own to the other side. On Shell Monster Island, there is a legend: Someday the Great Demon King shall be resurrected from the darkness, and a hero wearing a Shell of Fire shall come from the sky. At that time, gather the four shells of earth, air, fire, and water together, and stop the Great Demon King from returning from the darkness! And so now 1000 years have passed since the Demon King was sealed in the the darkness. The Great Demon King, Fat Badget has broken that seal, bearing an ancient grudge. He is destroying the villages of the continent one by one, enveloping them in darkness. The elders of the island knew the day would come when Fat Badger would come again, and then found three of the children within the island. "Immediately join you strength with the hero who wears the Shell of Fire, who comes from the sky, and defeat the Great Dark Demon King!" And so, the small heroes set out on a journey to defeat Fat Badger. But they were scattered by his evil power. And so, four small heroes begin their adventure. This page was last edited on 28 February 2015, at 05:00.